If you suffer from chronic bad breath that is interfering with your personal and professional life, finding a reputable professional who will totally eliminate the problem can become a fruitless search – until now. What makes finding the cure to bad breath so difficult? Many claim to cure bad breath, but in fact, they are only covering up the real problem. 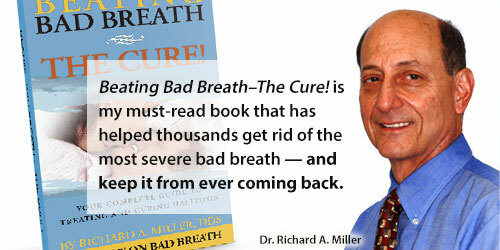 So, the first thing that you need is a clear definition of what a bad breath cure is. At the National Breath Center our bad breath cure is defined as “the total elimination of any discernible breath odor.” In other words, when we cure bad breath the direct cause of halitosis is removed. While most other breath clinics and specialists simply prescribe a regimen of products as their cure, our cure is clinical. This means that we manually remove the source of the bad breath odors and their related causes. As you can guess, this procedure can take some time if the layers of bacteria and causes have built up over years and even decades! But, this professional method is the only way to truly become free from bad breath. What’s more, you don’t have to worry if our cure is going to work. We are so confident in the success of our professional bad breath cure, we offer a money-back guarantee. When I began my bad breath career in the early 1990’s, shortly after my first book on bad breath was published, I was invited to speak at numerous dental meetings worldwide. At that time, I presented the cure I had been successfully using to approximately 10,000 dentists. I assumed that they would pass it on to their own patients. But some years later, here’s what I found. While researching my new book, Beating Bad Breath – The Cure, I decided to check up on some of the dental offices I had taught as well as some other bad breath clinics. 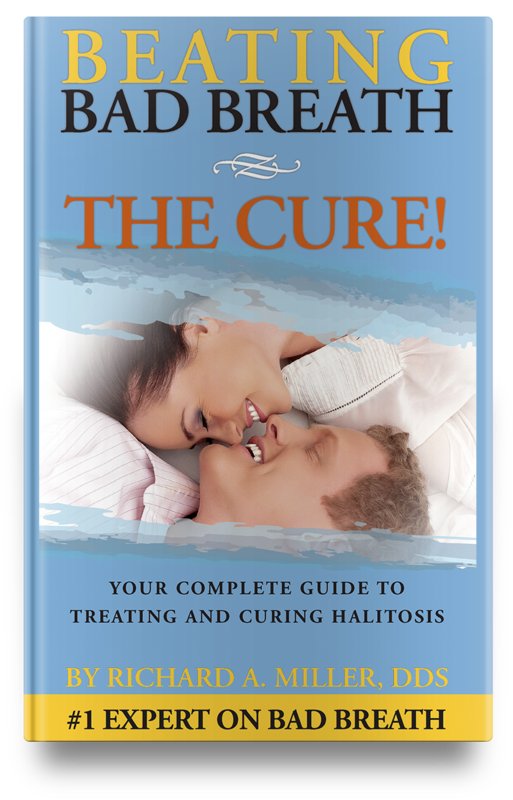 Many of the offices I talked with no longer treat halitosis, and those that do were all treating bad breath with one type of product or another and calling that a cure. I was shocked. That was it! What really stood out for me was that one nurse at a nationally-known dentist’s office who has a large presence on the web told me (when I called as a patient) that I would not receive any direct treatment from the doctor, but that I would have a diagnosis and leave with the products I needed. She added that I probably would not need to return as I would be cured by the next day. I knew that this doctor did not know how to cure halitosis and just sold products to cover-up or manage the odors. This was typical of the offices I spoke with – products, but no cure. If you’ve tried countless products, treatments and even risky medical procedures in order to finally be free from bad breath, finding someone who claims to have a real cure for this socially debilitating problem can seem too good to be true. Here are ways you can tell a real bad breath cure from a cover-up. A cure should eliminate the problem itself, all related causes, and provide the means to keep bad breath from coming back. You cannot get that in a bottle no matter who recommends it. If products must be used every day, that is temporarily managing a problem — not curing it. If you are searching for a dentist who says they treat bad breath, here are the questions I asked of other offices and clinics that I spoke with. To be sure you get actual treatment, I suggest that you ask these also. Does your office treat bad breath? How many people do you treat each year? Can you tell me something about how it is done? What methods does the doctor use to diagnose my problem? Do I have any treatment from the doctor? Can you tell me what the treatment is? These questions should tell you about how treatment is done in that office and whether they can cure your problem. While I have not surveyed every dental office in the country, after a good bit of research I believe that the National Breath Center is the only place of its kind that eliminates the causes of bad breath and offers a money-back guarantee on its professional treatment.